Crib mattress designed 60 x 120 cm including a practical roll cushion to promote proper posture baby during descanso.Se is a mattress designed for comfort baby made with 3D mesh fabric that promotes correct transpiration all times. 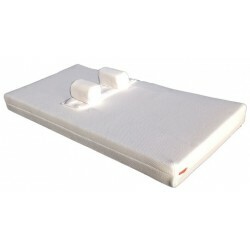 TÉCNICASMedidas CHARACTERISTICS Mattress indicated for cot mattresse..
Maxicunas mattress designed for 70 x 140 cm including a practical roll cushion to promote proper posture baby during descanso.Se is a mattress designed for comfort baby made with 3D mesh fabric that promotes correct transpiration all times. TÉCNICASMedidas CHARACTERISTICS Mattress indicated for cot ..
Crib mattress 140 x 70 cm (indicated for maxicunas) including also wedge slip and roll curler. This is the crib mattress most complete on the market since its accessories help prevent and solve common problems in infants such as reflux, colic or other respiratory problems, promoting better digestion..
Crib mattress 120 x 60 cm which also includes wedge and slip roller roll. This is the crib mattress most complete on the market since its accessories help prevent and solve common problems in infants such as reflux, colic or other respiratory problems, promoting better digestion, breathing and comfo..